Last night, I did the unthinkable, and actually drove myself through rush hour traffic in Silicon Valley to go to an event in San Jose. I did this for three good reasons. 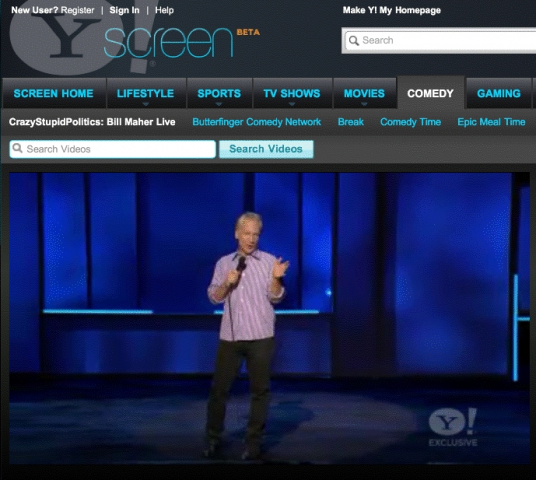 First, it was to see Bill Maher’s “CrazyStupidPolitics: Live From Silicon Valley” show, which was being being broadcast live and exclusively on Yahoo Screen, the Internet giant’s video destination. The event launched the Yahoo Comedy Channel, which will offer premium original video from some top talent for free, underwritten by advertisers. Second, Maher is really, really funny, and even better in stand-up than on his HBO cable show. Third, some Yahoos always think I am too mean to the company and don’t focus on what it’s doing right. To be fair, that’s because it has not been doing much right when it comes to stabilizing leadership, handling its longtime moribund board, and giving non-cat-wrangling direction to its talented pool of much-beleaguered employees. Thus — with some sort of usually self-inflicted fire drill going on all the time — there is a lot for me to report on, from persistent attrition to declining metrics to the latest bickering with its Asian partners. Which is why it was a pleasure to see the Maher event and then also watch it online, because it was done by Yahoo with the kind of beautiful ease that it used to roll out all the time from its media properties. When I say pleasure, it is a major compliment, since making and presenting content on the Web has usually ended in pain. Google-owned YouTube, as successful as it is, still hurts my eyes when I watch it, and has not yet become the kind of environment that big brands would want to live in for a long time. But, from its very first day, without a lot of fuss and noise, Yahoo has created and distributed some of the very best online content experiences from its undersung media units, whether it was Yahoo Finance or Yahoo Sports or Yahoo News. While there were some notable misses — there was a strange original news show produced in Web 1.0 that was so bad it was good — Yahoo has always had a strong talent for media distribution, and has the huge audience to aim it at. What has been a shame is the lessening focus the media side has gotten, despite its success over the many years, and even though many of its channels have long been No. 1 across the Web. The often short shrift has been largely due to the faux struggle between whether Yahoo was a media company or a technology one. It has been an exhausting and toxic debate within Yahoo over the years, with no clear conclusion. But here’s the truth: The Maher event showed that what Yahoo can do well is be a high-level, high-quality, highly selective distributor of media of all kinds to millions upon millions of users. This has been and can still be — if properly organized, staffed and sold — a very good business for Yahoo, which has always treated it like some sideshow, rather than the main one. I get that, of course — why be in a media business, when the pickings are so good in search, commerce, social … whatever? Why? Well, because a terrific guide of all sorts of media experiences online is what Yahoo was from its very start, and what it has since tried not to be as definitively. Having covered Yahoo from its very beginnings, it has been a lot like watching someone you think looks good in one outfit change into one ill-fitting and inappropriate get-up after the next in search of the right image. But if the company only cared to take a look at how well and seemingly effortlessly it pulled off the Maher event, it would know immediately what it has always done well is what it should always be doing. The Maher live offering was not fancy and it was not flashy and it did not have all kinds of the latest trends hanging all over it. It was just good, well done and well worth a watch, whether in person or at home. And it was very, very funny. It would be nice, then, if Yahoo learned to laugh like this much more often.